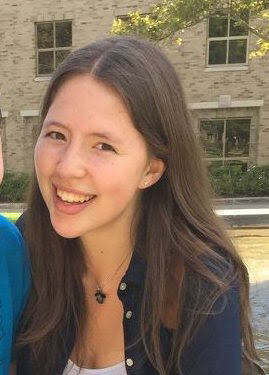 I am a freshman from Darien, Connecticut majoring in computer science and minoring in Japanese. I also play violin in the Notre Dame Symphony Orchestra. Traveling with my orchestra in high school I have been able to visit Europe a couple times, and I have really loved experiencing other countries and cultures. I have never been to Asia, so I am very excited to see Japan for the first time this summer. I have been very interested in Japanese language and culture for a long time. Learning languages has long been a passion of mine, and I am so excited to have the opportunity to acquire another one, especially such a difficult one as Japanese. I have chosen Japanese because I feel such a great void in my knowledge and understanding when it comes to the Eastern world, having grown up in a school system that focuses mainly on the West. I am fascinated by Japan’s unique culture and by the completely different structure of the language. I began independently studying Japanese at home last summer, and absolutely loved my first semester of college-level Japanese. I yearn to learn more about Japanese culture and to someday develop a high level proficiency in the language, and this grant will be so important for helping me accomplish this. I am hopeful that I will find a way to use Japanese and other foreign languages in my career for the rest of my life, since it is so important to me. My intended major is currently computer science, and some careers that intrigue me involve work in translation software, language learning software, and/or voice recognition in many languages. I will consider working overseas and being involved in international companies. Unfortunately, with a major in the college of engineering, I don’t have many electives with which to learn a foreign language even though I really want to combine these two interests somehow in the future. Getting to complete an extra year of Japanese this summer is really important for enabling me to get a Japanese minor! I am so grateful to have this opportunity. Japanese is widely known to be one of the most difficult languages for an English-speaker to learn; it is said to require at least 4 times as many hours of study as Spanish does to achieve proficiency, and that it is extremely difficult to achieve without lingual and cultural immersion. This is why it is so important to me to study Japanese in an immersive environment this summer, and I think it will help me improve my Japanese by leaps and bounds in only two months. I will also get the opportunity to stay with a host family, and I am excited to learn about Japanese culture first-hand through this, because it is such a huge and important part of being proficient in the language. I am hoping to broaden my perspective and become more of a global citizen through this as well. At the end of the summer, I will be able to speak, read, write and listen at a level of proficiency equal to two semesters beyond my current Japanese coursework placement at Notre Dame. At the end of the summer, I will be able to demonstrate significant tolerance for ambiguity and a willingness to take intercultural risks by engaging in cultural and linguistic interactions that are beyond my level of mastery and comfort zone. At the end of the summer, I will be able to live and function with ease in an area where Japanese is the primary language of communication. There is “Japanese-only” rule in effect inside the program building, but I intend to use only Japanese as much as possible in the building and out, especially as I become more proficient towards the latter half of the program. I will definitely be putting my all into this experiencing, and working very hard to learn the vocabulary, grammar, and kanji and try integrating new structures into my speech and writing as I go along. Additionally, I will make an effort to take full advantage of the cultural learning opportunities offered by the program and to get to know my host family. I don’t want to miss any opportunities to learn!